The Dallas Morning News once said that these pillows were "really, really amazing." A Wall Street Journal columnist once used the word narcotic. Caroline Kennedy has dubbed The Pillow Bar to be "the Rolls Royce of pillows" and most recently, The Pillow Bar was an addition to the coveted ‘O’ list. These are unique pillows, custom made for each and every customer according to their size and sleep habits. They are finished with a custom monogram or message, making them particularly well suited as a gift. 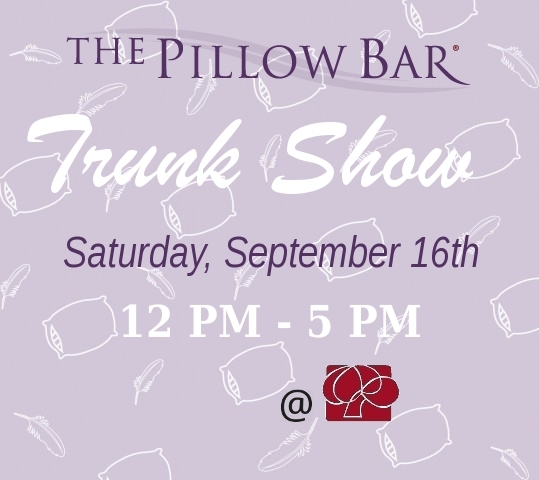 The Linen Tree is proud to welcome Pillow Bar inventor (and owner) Merrimac Dillon to our store for a trunk show on Saturday, September 16th. In addition to sampling the entire line of pillows and sleep accessories, our customers will have the unique opportunity to meet with Merrimac one on one and to be personally fitted with their own custom pillows and gifts. There will be door prizes, giveaways and more on the 16th, but Merrimac will be available for individual appointments all weekend. To book your appointment, get in touch with Kendra or Mark! This entry was posted on Thursday, August 17th, 2017 at 11:16 am	and is filed under Official Updates. You can follow any responses to this entry through the RSS 2.0 feed. You can leave a response, or trackback from your own site.